Jook is a dish that my mother used to make all the time. It is a porridge with roots in the Chinese countryside, developed as a way to stretch an already low rice supply. It was also traditionally eaten by those who were sick, since its mild consistency is easily digested. 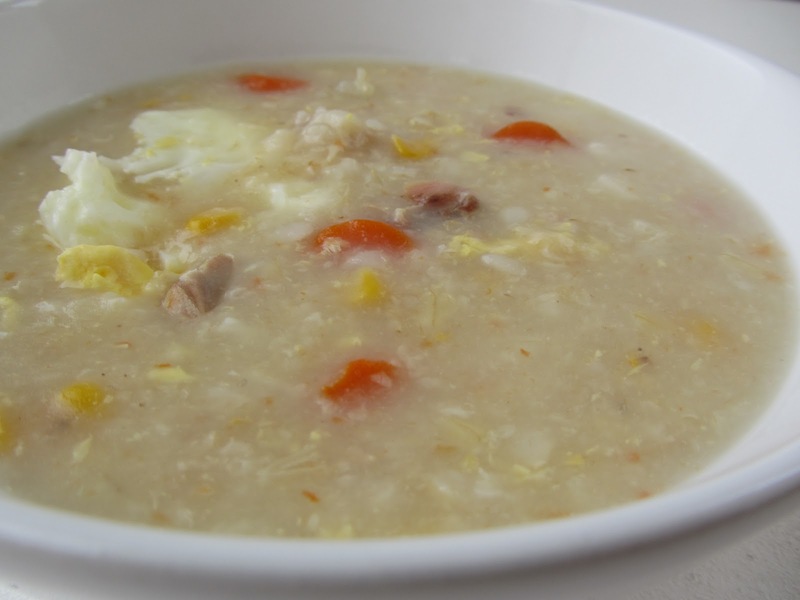 Jook is basically made by boiling rice in a large amount of water until it has basically disintegrated. Normally served with preserved duck eggs, salted fish, or fried bread sticks (yu jah gwai), though these condiments may be hard for some to find, I’ve tweaked this childhood dish of mine so that perhaps you can enjoy it too. It is a bit more accessible when served with some carrots, corn, diced chicken, and a poached egg. I especially like to make this during the holiday season. Not only is it a warm comfort food to have on a cold winter night, it is also a great way to use that turkey carcass (or holiday ham shank) that I always save. Just toss it into the porridge and it will impart so much flavor! 1. Place the rice, chicken broth, water, and salt in a large stock pot or dutch oven. Bring to a boil, then reduce to a simmer and cook, covered, until the rice has broken down into a thick and soft porridge. Stir occasionally to keep the bottom from sticking or burning. Add more water as needed if the jook becomes to thick or dry. 2. Halfway through cooking, add in the carrots and corn. 3. Several minutes before serving, drop the egg in to poach. 4. Serve hot, season to taste with soy sauce. * I write this recipe very loosely. My mother made this by using uncooked and leftover cooked rice, adding water continuously until the porridge was ready. Very free-form. * Can easily be made vegan/vegetarian by replacing the chicken broth with water.